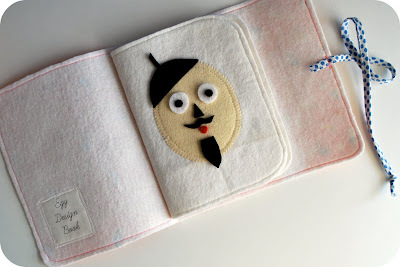 I had something sort of traditional in mind at first for this little egg design book, but then just found I loved making the kooky monster and character faces more than anything else...so the shapes I started cutting out from felt became more and more conducive to facial features rather than stripey and dotted eggs. 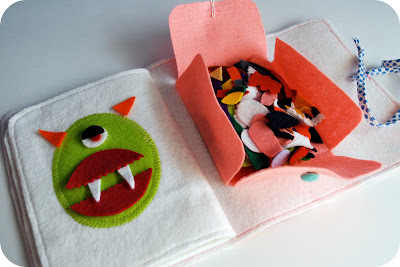 Whatever the case, I love the portability of this book and its open-ended creative potential using just basic felt shapes in a variety of colors. While I admit, it has taken me all week to really work out the end result you see here, the book really should come together quite easily. (don't let the 9 pages of instructions scare you--almost half are rectangular templates). Please take photos of any new and interesting egg designs you or your kiddos come up with and share them in my Beeper Bebe Project Flickr group--I would so love to see them. Just because I know you will come up with some good ones, and I want to share in the fun. Wow!! Thank you!! What a great idea!!!! It's wonderful!! that is hundreds of kinds of awesome. Thank you for being so generous with your amazing designs. Great Idea! I'll have to keep this in mind for when my little one gets a bit older. wow, how clever! great job!thank you for sharing this, it is really great!!! wow,how clever! Thank you for sharing this!!! i love it! anyone got some smelling salts for Veronica? Really, when I make these tutorials, my intent is never to hurt anyone. Everyone, please be careful--I just want everyone to enjoy the crafts without getting hurt--okay? how much are you selling them for? when are you adding? I love this. Great work! I like the idea a lot and it is lovely too. omg this is amazing I am going to make this for easter this week! what an amazing cute gift! I saw you on Craft Gossip! Oh I love the felt face book! What a fun idea. I love it so much that I had to share it on my blog!! I'm going to have to make one or my son is a few years when he's older. That is adorable! I love it! Great!! And the felt is sticky enough to stay on place? 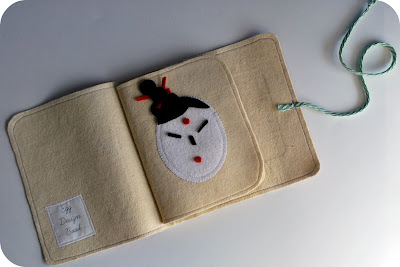 Made by KK: Yes, the felt "sticks" to the egg--or the pages. You can even hold it up right and the pieces will stay in place. Of course, they are not like stickers either-but it works just like any traditional felt board does. These would make awesome gifts! Oh wow. This is fantastic! Thank you so much for sharing, I'll be linking to this. This is so friggin' cute! I love it. I'm totally making this. Thanks so much for the wonderful tutorial. This is an awesome tutorial. Thank you so much for all the ideas you share with us. 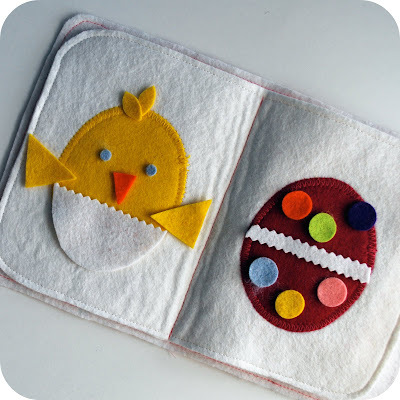 I was wondering do you just use regular craft felt, or wool felt for the eggs and shapes? THanks again! your projects are always fun! Awesome, awesome and adorable! So much opportunity in this for tailoring it to the individual interests of your child. Thank you! LOVE, LOVE, LOVE, LOVE!!! Thank you! love this idea. thank you for sharing! thank you so much for this tutorial!!!! Thank you for the awesome tutorial! 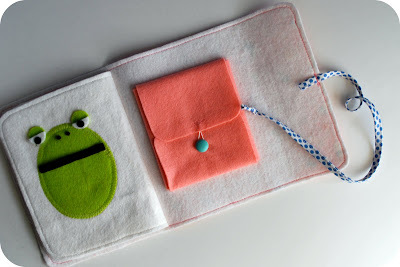 I just posted on my blog about the 2 books I made with your instructions. I will post photos in your flickr group too. Thanks again!! That is so clever. I love it!!! Thanks for sharing the tutorial and pattern. this is awesome!! i'm going to have to make one for my little boy! We love this idea. 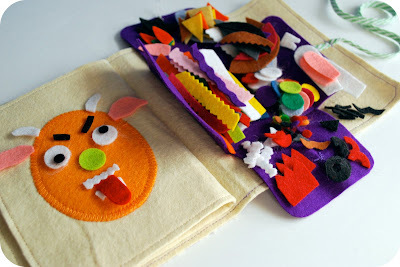 We are featuring it in our DIY Literacy Projects over at http://www.onthelap.org. Stop by and snag our "Featured" button and help spread the word. Thanks for sharing. espero tu mjito! !beso y exitos! So Cute and Creative - thank you so much for sharing! This is absolutely amazing! What a fabulous idea! I would LOVE for you to share this at my For the Kids Friday Link Party. Please, stop on by! What a fantastic idea and design. 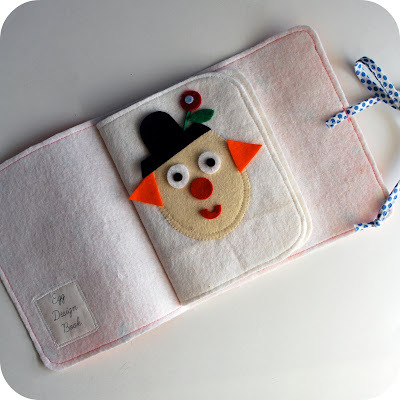 I have shared this on my website that features free felt patterns. I also love this project so much, it would make such a lovely gift instead of all that bad chocolate. I loved it so much I also featured you on my blog today as one of my favourite Easter Crafts. Feel free to check it out and thanks for sharing! Very cute! Thanks for sharing. 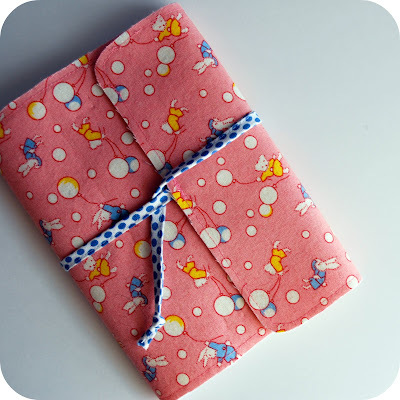 All of my work (photos, designs, patterns, blog content, etc.) represented here, and elsewhere, is protected by copyright. Please feel free to link to posts on my blogs. Please DO NOT direct link to any of my PDF downloads--instead link to the post at my blog that contains the download. 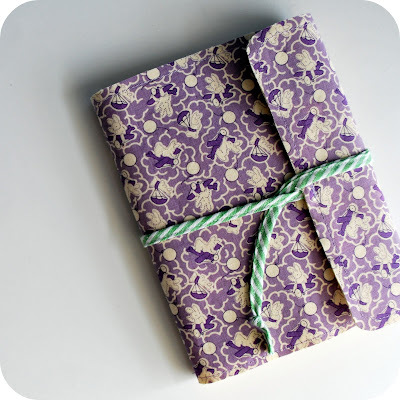 Please do use my patterns, pdf downloads, recipes, etc. for personal (for you or for gifts), but not commercial use. If you are not certain about something, just email me and ask--I respond to emails. And hey, have a swell day.